The State of Grenada consists of three islands - Grenada, Carriacou and Petite Martinique. It is at the southern end of the Windward Islands in the Caribbean, north east of Trinidad and Tobago. Most of the diving in Grenada island itself is in the south. Her most famous dive site is the Bianca C, the largest wreck in the Caribbean. This Italian passenger ship sunk in 1961 is covered in life with visiting barracuda and eagle rays. Carriacou is also a good diving area. Why dive Grenada? Apart from the Bianca C there are many other wrecks. For less experienced there is the Molinere Underwater Sculpture Park was created in 2006 by Jason deCaires Taylor, the first of several of his works now in place underwater. Corals have colonised the figures turning the park into an artificial reef. For more advanced divers Fisherman's Paradise, where the Atlantic meets the Caribbean at the extreme south-west of Grenada, is a great dive. Best time to dive Grenada? You can dive year round but the best time is during the dry season between January and May. The rainy season is June to December with August and September having the highest risk of tropical storms or hurricane. Average temperature ranges from around 25 oC in January to 31 oC in August. Water temperature is always warm, never dropping much below 27 oC. This enormous ship, 180 m long, was an Italian passenger liner on route from Venezuela to Europe in 1961. She docked at Grenada to pick up 15 passengers on route for Britain. At 9.30 in the morning, whilst at anchor, something in the engine room exploded. A fire and more explosions followed. Lifeboats were lowered and many crafts from the shore helped to evacuate the passengers and crew. Two people died plus another later in hospital from burns. A British frigate, the Londonderry arrived two days later to help put out the fire but they were too late - the ship had started to sink. It would have blocked the harbour if it sank where it was so the Londonderry attempted to tow it out to sea. They managed to move the burning vessel 3 miles before the tow line broke. The Bianca C sank about a mile away from Grand Anse beach. Today the Bianca C is a popular dive site with experienced divers - the Caribbean's largest shipwreck. The shallowest part is at 25 m but the deck is at 30 m and she lies at 50 m - you need to be at least PADI Advanced or equivalent. Many large animals visit or live around the wreck - eagle rays, reef sharks, nurse sharks, giant morays and barracuda. The wreck is covered in sponges and coral. "Reef dive on a fringing reef of a small island in the bay. Shallow (6-18m) and with plentiful hard and soft corals and sponges. Amazing nurseries with Chromis and Creole Wrasse "
"What a site! It has it all. You drop into a sandy patch at about 8m before descending over the reef wall to 18m. A short swim out into the blue and you come across the 'John D. Wacka' or 'Tuglett' as its referred to. A small wreck lying in 23m in an upright position. The wreck is home to plentiful Sgt Majors and Surgeon fish. The dive then heads back to the wall, where we encountered a Spotted Eagleray. We started to ascend up to 12m and popped into a little coral alcove. The seabed was alive with volcanic bubbles rising up from the sand. It was like diving through a champagne glass! We headed back to the start of the dive across the top of the wall, and spotted 3 sleeping nurse sharks and a large family of spiny lobsters. Very good site! " Sank in 2005 and lies at275 m.
Lying at 35 m ex WWII vessel sank doing an inter-island run between Grenada and St Vincent in 2017. Look for nurse sharks and rays. A very recent wreck, scuttled in 2018. She lies between 7 and 17 m.
Recommend a dive centre or list your diving company on this page. "We dived with Deefer Diving, a newly established PADI 5 Star Resort on the charming island of Carriacou. Deefer is owned by and British couple, Gary and Alex, and the tuition and diving were first class. I did my Open Water course with them, at a cost of $550, and had some issues with confidence. Gary was incredibly patient and able to coach me through my fears and in the end I had an amazing diving experience. They offer 2 free fun dives after your course which I thought was a nice touch too. I would definitely dive with them again The boat is a little small, but fine for the group sizes Deefer Diving cater for (maximum 6 divers). I've only dived in Cyprus before.....and this beats it hands down. I'm planning to go back there again next year and do my Advanced! " Open year round. Give a full refund should a named storm hit Grenada. 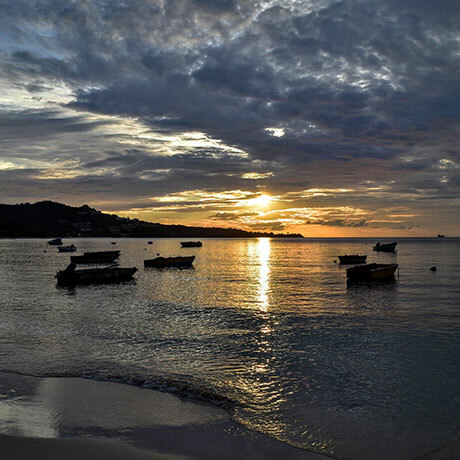 "Sandals Grenada is an excellent all inclusive couples resort that includes diving daily for Open I and II certified divers at no additional charge. Night dives and certification courses are offered at additional cost. The marine park and sharks reef were great dives for beginner and intermediate divers "
Please send us your comments on Grenada. Do you want to recommend a diving centre or dive site? Let us know. Have a question - we're waiting to hear from you.